Today SwiftKey announced that they’re launching an assistive app called SwiftKey Symbols. 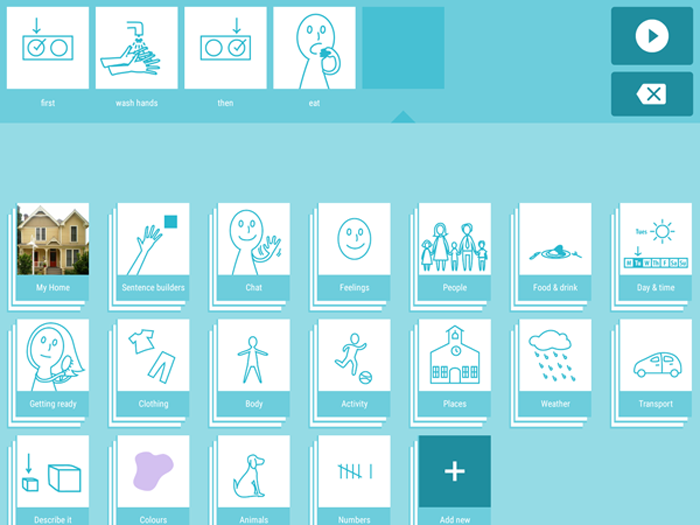 The app aims to help “young, non-verbal individuals with special needs.” The idea for the app came from SwiftKey staff members with experience dealing with autism in their families. Conceptually, SwiftKey Symbols makes immediate sense. Rather than a keyboard, the app uses a system of ‘cards’ with symbols drawn on them. These are much like the image cards sometimes used to help individuals with autism communicate their needs and wants. However, SwiftKey has an advantage over a stack of note cards because their core contextual language prediction technology allows it to build sentences from the chosen image. It also actively tracks the user’s routines and adapts the symbol layout to make more commonly used symbols easier to access. Although the app is a common-sense fit for people on the autistic spectrum, it can also be used by people with other communicative difficulties. Stephen Hawking, for instance, regularly uses SwiftKey technology to communicate, and Symbols could be an elegant solution for younger people with similar conditions, like Locked In Syndrome. The communication opportunities that this app will provide are amazing. The flexible use of symbols will allow pupils with severe communication difficulties to express themselves in meaningful ways and the predictive symbol function means that it can be truly personalised. Brilliant! To read more about SwiftKey Symbols head over to their blog. To give the free app a try for yourself, click the button below to download it from the Google Play Store. If you know someone who works regularly with autism or other communication-impairing conditions, let them know about this new free assistive tool.